Ray Anderson and the Magic of Richard Forget team up for a night of comedy, magic and illusions. High energy, laugh out loud funny, state of the art illusions and lighting make this show a night you won’t forget. This is an exciting new journey for the Fight To End Cancer as the fight expands outside of the confines of the boxing ring. The show in January will be the first of the national tour that Richard and Ray will be embarking on. In addition to raising funds for the charity, a portion of every ticket sold will be donated to the Fight To End Cancer. In the months leading up to and throughout their National tour, Richard and Ray will be competing to raise funds for the Princess Margaret Cancer Foundation. Our gala event is just one part of an ongoing fundraising effort by Fight To End Cancer, which will continue throughout the year and whose success will in large part, rely on community teamwork and continued media exposure. Though the Boxing Gala in June 2016 will continue to be the “Main Event” celebration of our fundraising efforts, partnering with the Battle Of The Magicians brings two new members to our #FTEC2016 Fight Team. With these efforts, we are confident we will reach our goal of raising over $1,000,000 annually by 2018 to support this cause. 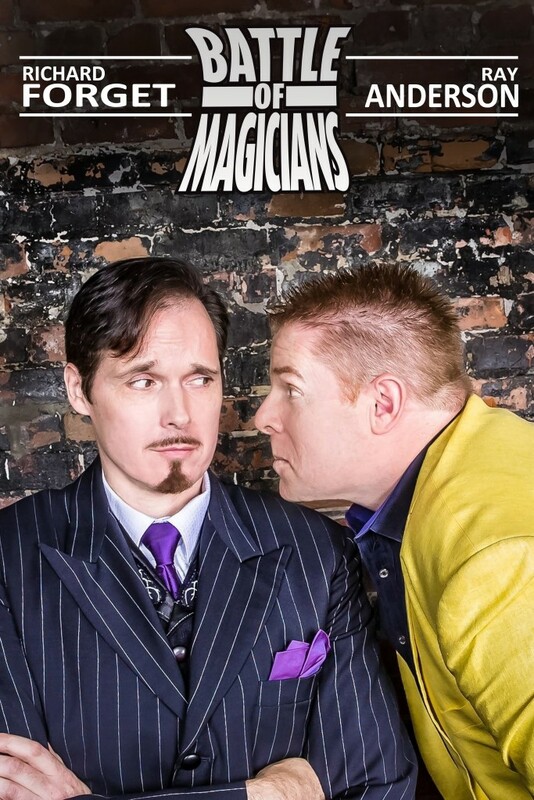 What do you get when you combine two magicians of differing styles into one show? You get mix of comedy and illusion that is fuelled by showmanship and skill honed through thousands and thousands of shows performed throughout the world. You get a battle of contrasting styles in a unique and entertaining battle of skills and will. What you get is The Battle Of Magicians. Ray Anderson and Richard Forget have combined forces to create a new magic spectacular that is a battle for YOUR attention. Ray and Richard challenge each other in a lighthearted competition that pits Ray Anderson’s comedy magic against Richard’s classic style and presentation. It is an enthralling encounter that culminates in a spectacular finish. Ray Anderson has starred in countless cross country tours across Canada and is a founder of The Battle Of Magicians. With six national tours under his belt, he has performed from New Brunswick to Vancouver Island; performed in NYC, Vegas, Chicago, Orlando, New Orleans and even Bermuda. He has performed on TV, radio. Ray has brought his unique brand of comedy, magic and skill to casino’s and corporate events across the nation. In fact he has performed in over 3,000 shows in his 25 years of being an entertainer. Richard Forget is simply one of the most awarded magicians in magic. He has performed across the globe before millions of people on television and on stage. Richard is renowned for being a creator and innovator of new magic! He is the only two time stage champion of stage given by the International Brotherhood of Magicians and has been awarded Canadian Magician Of the Year. In France he was awarded the Mandrake D’or on national television which is considered the Oscars of magic. He has brought his particular brand of magic to China, Thailand, Malaysia, England, USA, Algeria, Hong Kong, Taiwan, Denmark and Sweden just name a few places. Saturday January 30, 2016 will be a spectacular night that combines world class magic and comedy plus giving back to the community. How could you miss the battle?